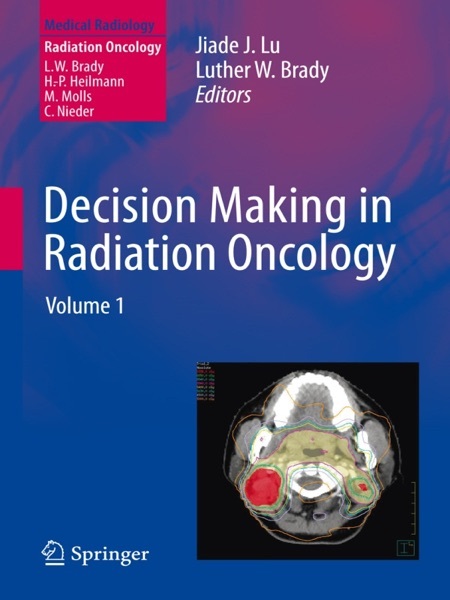 Decision Making in Radiation Oncology is a reference book designed to enable radiation oncologists, including those in training, to make diagnostic and treatment decisions effectively and efficiently. The orientation of this groundbreaking publication is entirely practical, in that the focus is on issues relating to cancer management. The design has been carefully chosen based on the belief that “a picture is worth a thousand words”: Knowledge is conveyed through an illustrative approach using algorithms, schemas, graphics, and tables. Text is kept to a minimum, reducing the effort involved in reading while enhancing understanding. Detailed guidelines are provided for multidisciplinary cancer management as well as for radiation therapy techniques. In addition to the attention-riveting algorithms for diagnosis and treatment, strategies for the management of disease at individual stages are detailed for all the commonly diagnosed malignancies. Detailed attention is given to the core evidence that has shaped the current treatment standards and advanced radiation therapy techniques. Clinical trials that have yielded “gold standard” treatment and their results are documented in the schemas. Moreover, radiation techniques, including treatment planning and delivery, are also presented in an illustrative way.